We talked to students from Dundonald High School – Sophia Mitchell, Jack McNeill, Sofia Dinis and Rita Dinis, along with their Art teacher, Tracy Hutchinson, who attended the Hit the North Street Art Conference, held at the Black Box, in September. Did you know anything about the Hit the North Street Art Conference before you set off from school? Tracy Hutchinson – We knew a little about street art and a little about graffiti and so we had a few ideas about what we might see and we thought, perhaps, that we might get to chat with some of the artists, but we never expected to see the quality of work, the size and scale of the art work and the way the artists went about their work. We also didn’t expect to see the artwork actually being created while we there. We got to see a woman (CASHINK) painting on a wall near the black box and another artist on a wall near the MAC. Again the size and scale and the quality of the art work was way beyond what I was expecting and what the students were expecting to see. We were able to chat to one of the artists while they were actually creating a piece so that was pretty special. For me it was really great to have students see the work and the creative process first hand. 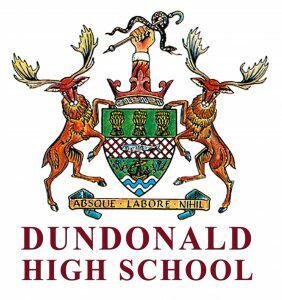 Students at Dundonald High School with teacher Tracy Hutchinson. Did you know anything about street art before you went to the conference? Jack McNeill – We knew about Banksy. We’d watched the film about Banksy. And we had some idea about tags and graffiti, but no idea about exactly what we would see. We hadn’t seen any street art in Belfast before, not in the city centre anyway. What struck you when you first arrived? Sophia Mitchell – We got our portraits done as part of the Guinness Book of World Records (part of Culture Night), then we saw the huge painting of the two women. (Joe Caslin’s Gay Marriage Mural) When we into the conference, we saw the young man’s art which was very abstract and very different from the art outside. (Sam Le Bas) He said he had a background in graphic design I think and that went into his street art. He worked with computer programmes as well as paint. You saw some of the street art pieces? Sophia Mitchell – We got to see one of the women working on a painting of a man with a beard – (CASHINK) We saw what she was doing at the beginning and how it had progressed when the conference ended. Jack McNeill – I thought the artwork was great. Some paintings affected me and made me feel quite emotional. 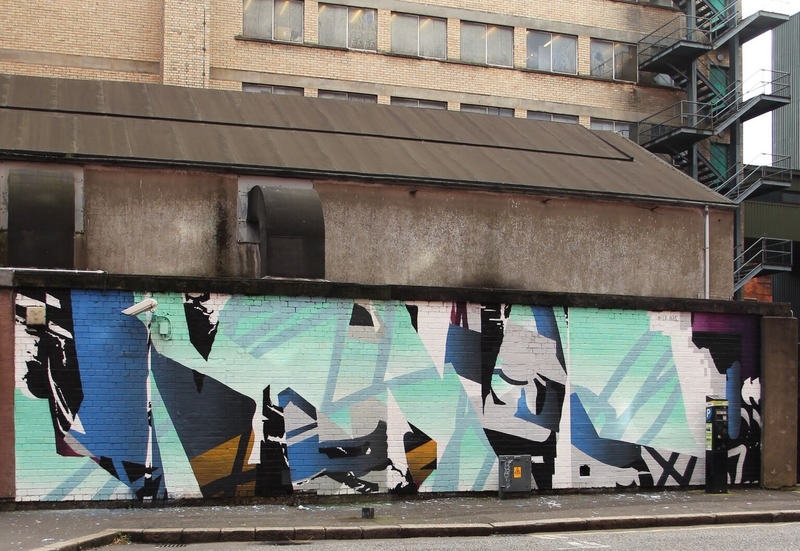 Sofia Dinis – The detail of the work impressed me – I didn’t think that you could do that with spray cans. Sophia Mitchell – We saw a man painting a street scene with a car. I was talking to our teacher trying to work out how he knew what he was doing. How did he get the detail using spray cans. Tracy Hutchinson – Some of the work, it looked like they used stencils, others it looked like wall-papering the area, but I was asking myself all sort of questions. How do the make sure the perspective works, how do they work out what colours work and how do they decide what will work on a particular wall. What did you think about the Art you saw at the conference? Sophia Mitchell – I took a lot of notes, Joe Caslin, his work was incredible. I really didn’t think it would be as good as it was, that it would be a proper work of art that lots of people could be interested in and would get a lot out of looking at. Sofia Dinis – I thought the detail was very good. Did what you saw have much of an impact on you? Sophia Mitchell – We talked about how would we go about being street artists. What walls do you use? Where do you get the spray cans? How do you practise? I mean is there a practise wall somewhere? What did you think about a street art festival taking place in Belfast? Jack McNeill – It was great, really brightens the place up. I thought it made Belfast more connected to what is happening in other places. Tracey Hutchinson – It was nice to see art somewhere other than a museum or a gallery. A lot of students don’t connect to artworks because they are in a gallery, but if it’s out in the street, that makes a huge difference and they seem to connect to the art more quickly. Sophia Mitchell – You can relate to it a lot more if it’s just in front of you. Rita Dinis – I thought it was easy to relate to. I liked that you could just walk up to. It made me think that I would like to be an artist. Tracy Hutchinson – I think it was great that we could get the students out of the classroom so that they could see what other artists are doing, how art is created. It also gave a sense of perspective, sometimes students are given an A1 or an A0 sheet of paper, they think that is huge and wonder what how they are going to fill the page. Then you see someone working on a wall and it’s massive and it shifts your whole perception of what is possible. Sophia Mitchell – I think we need to have a practice wall for students who want to get involved in street art. When you are young you need help to get involved in something like this. Community Arts Partnership – Thank you and we will see what we can do about the T-Shirts.